As the University of Minnesota transitions from Moodle to Canvas, CEI will be highlighting some of the ways that instructors can leverage Canvas to meet learning and teaching goals. This is the first of four planned posts for this academic year. As instructors, we want students to come to class prepared, complete assignments on time and know about any changes to assignment deadlines. Key Canvas features can help you communicate your expectations to students and help them keep up with your course. The auto-populated Calendar and To Do List along with automatic Notifications can provide students with timely reminders. In addition setting Requirements and being able to list an assignment in multiple places allow instructors to more clearly indicate their expectations. In Canvas, instructors have two primary ways of guiding students through content: they can create Pages which give instructors complete control over the organisation and creation of content through a Rich Text Editor; or they can use Modules which organise content by week, unit or other organisational structure for your course using a drag and drop interface. The features we’ve chosen work regardless of where you land on the Pages vs. Modules decision, with the exception of setting requirements which is only possible if using Modules. Our recommendation in reviewing the suggestions below is to select the ones that align best with your course and communication style, and then to be consistent. Tell students at the beginning of the course how you will be using Canvas and use those features consistently throughout the term. 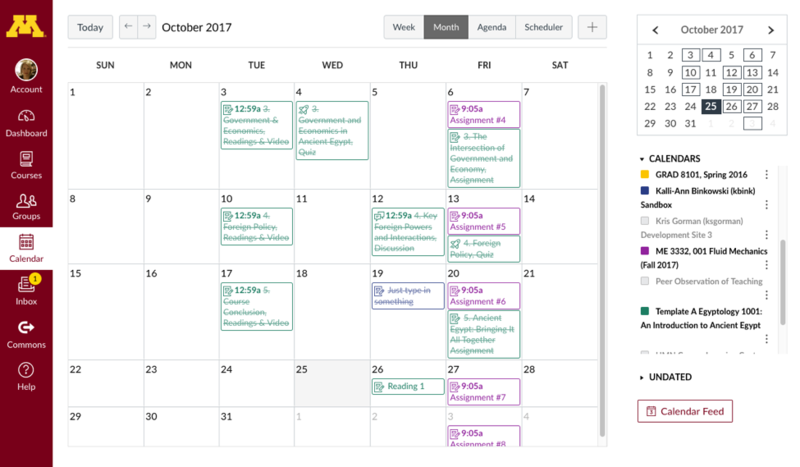 Canvas’s Calendar offers some great opportunities for communicating deadlines and work expectations to students. The Calendar automatically updates to include any assignment, quiz or event you’ve created for your course. In the screenshot, you can see assignments for three different courses, each in a different colour. These assignments appear on both an instructor’s calendar and students’ calendars. Completed assignments are crossed out. In addition, selecting the Dashboard in the far left navigation brings up a To Do list in the right hand side of the screen. Students’ To Do lists are also auto-populated with assignments and quizzes for their courses. The To Do list on an instructor’s Dashboard also shows reminders to grade submitted assignments. An example of what an instructor would see is shown in the screenshot below. To make the most of this feature, when you provide students with readings or class preparation work, don’t simply add a link in a Page or drop the PDF in a Module. Instead create an ungraded assignment with a due date at the time of your class. Use the Rich Text Editor in the assignment description to link to the files or URLs and add additional context or instructions. These assignments will appear on students’ Calendars and To Do lists and when they click on the assignment from these views, they will be brought to the assignment description with all of the relevant links. 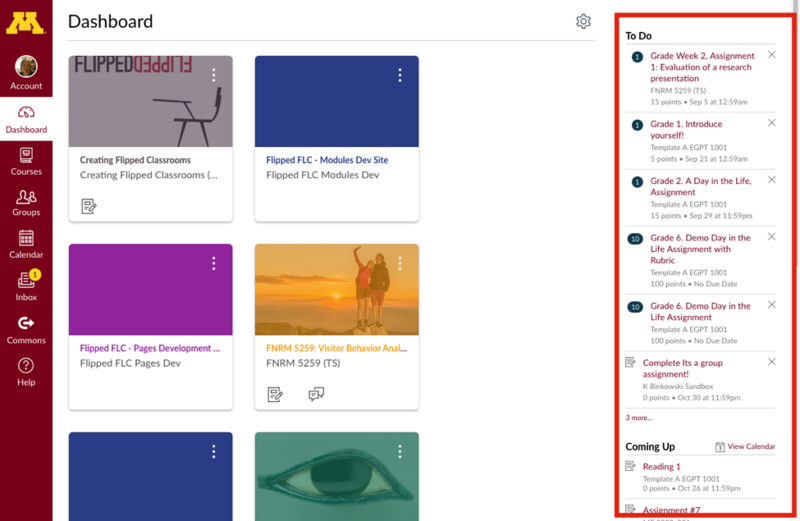 Canvas can be set to produce helpful notifications for students that keep students apprised of calendar-linked activities and deadlines even when they’re away from the Canvas platform or app. Before saying more about this feature, the most important thing we can point out is that students must activate the notification feature within their Canvas set up in order to receive and view the notifications you opt to send. What I’d always lead with when the semester started was a walk through of notifications. Essentially, I’d say that I’m going to use Canvas to communicate with them and that Canvas will automatically send them other helpful reminders, too, so they need to have their notifications turned on to keep up with the course. Students generally liked the notifications, and fact that Canvas now allows for push notifications on mobile devices is a bonus. Notifications is a way for students to keep track of Canvas assignments, tasks, and deadlines when they are not logged into Canvas. The notifications meet them where they’re at–university email, personal email, smartphone–which is why I think it’s such a critical feature. One additional, and important, note: When you update a Page in Canvas, you can select whether you’d like your students to be notified about this change. This can be a useful feature if you want students to be notified when you update a reading, post an answer key or otherwise make change to course content. Just take care to check that you’ve turned off notifications to students when you’re at the stage of making edits to a page! If you are using Modules to organize your course content, you can also set requirements for the module which makes it possible to set activities students must complete or actions they must take before the module is considered complete. In setting requirements, the Module display will display a word or phrase to let students know whether the task is to, for example, view/read something, submit work, or reach a certain score in a quiz in order to move to a next stage, or to complete the module. Whether you are using Pages or Modules to guide students through your course, you can easily add links to assignment descriptions for upcoming large assignments. For example, if you have a paper due in Week 5 and in Week 2 you introduce that assignment to students and want them to read the assignment description, you can add a link to that assignment in Week 2. 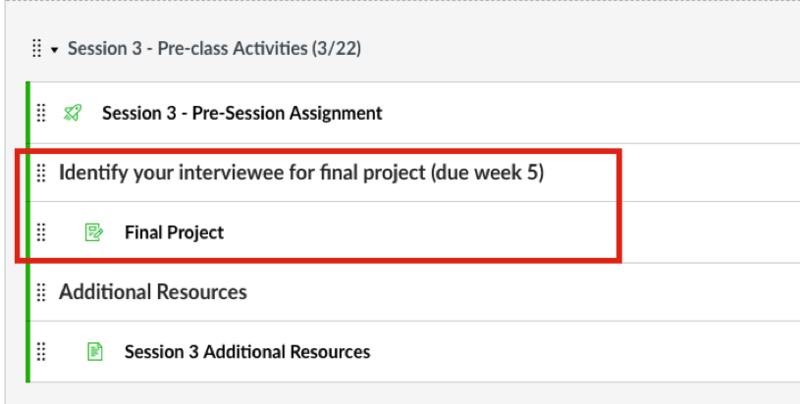 Another example might be that a formal report due during Week 7 that’s based on an interview due in Week 5; you want to link to the assignment instructions to remind students during Week 2 that they need to select an interviewee and list questions, and again during Week 5 to highlight the next stage of the assignment due at Week 7. If you’re having students navigate your course via Pages, you can create a link to that assignment. If you’re using Modules, you can add the assignment to multiple Modules. All of these links will point to the same assignment description, submission page and gradebook item. ← Why do we fixate on particular data?